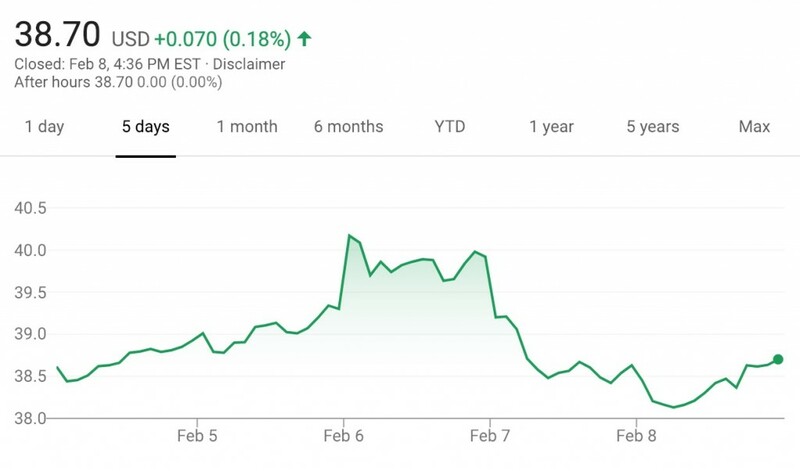 The value of GM stock remained level during the February 4th, 2019 – February 8th, 2019 timeframe, closing the week at $38.70 per share. That represents an increase of 0.1 percent or $0.05 per share. This marks the fifth consecutive week during which GM stock saw an increase in value. Shares jumped to nearly $41 per share on Wednesday before settling back down by the end of the business week. The rally initially commenced in early January, as GM held an investors conference prior to the start of the Detroit Auto Show during which the automaker presented its strategy for new models intended for developing markets as well as several future Cadillac vehicles, while explaining how both efforts will contribute to its bottom line well into the future. A day later, GM unveiled the Cadillac XT6 “midsize-plus” crossover SUV and pre-announced an electric Cadillac crossover. Several macroeconomic factors also appear to be aiding the ongoing GM stock rally, including the semi-permanent end of the governmental shutdown. Stay tuned to GM Authority for ongoing GM stock news and complete GM news coverage, and be sure to check back in Friday afternoons for our weekly analysis of General Motors stock performance. Next story Blackwing vs. Northstar: Which Cadillac Engine Name Do You Prefer? Meanwhile, profits declining, quality rankings lowered, sales forecasts dropping, and stupid bets on China and Mexico while firing almost 20,000 members of your American and Canadian workforce and counting…All the while the competition, foreign included, invest in the U.S. and Americans, building plants and proper auto companies. Anything to say for this Miss Mary ‘Machete’ Barra? Barra? She makes more money than all the CEOs of the other companies you are alluding to that are investing in quality and American jobs. Business types, accountants, bean counters all have two things in common: They don’t know understand cars very well, and they don’t understand people very well. They are a necessary evil of all manufacturing, but at GM they get to run the show. Next time, let the ship sink. That’s exactly why Mary Barra is evil. She makes too much money but has no problem firing almost 20,000 Americans and Canadians without any care, thus destroying their families in the process. She should be so proud. Time to reduce her pay in line with the industry. If she can put GM above Toyota, then maybe she can make a little more. Nothing else. Barra does not come from a “Business background”…She comes from a lefty, SJW, affirmative action one. I have no problem paying CEOs a large salary when they are successful. The late great Sergio Marchione was worth every cent. I do have an issue with people like Machete Mary whose salary was rewarded on the backs of the thousands of people she fired. I am sure her salary will be even more this year. What are you going to do when it goes up the first of the week? You realize the entire market was down a Friday.